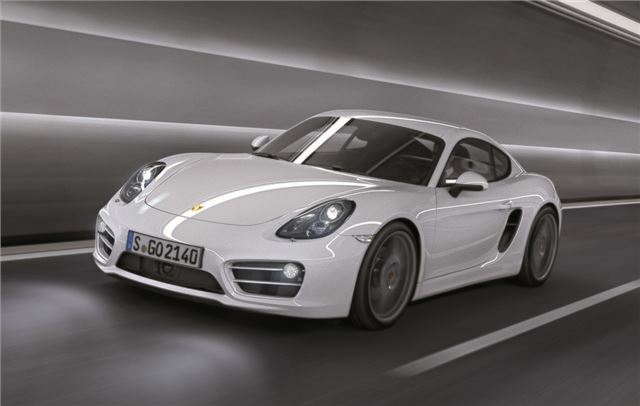 Porsche has unveiled the new Cayman which arrives in the UK in March 2013. The new mid-engined coupe takes the styling from the latest Boxster, launched earlier this year, with a more aggressive look plus there's a redesigned and much improved interior. It's available to order now with prices starting at £39,694 for the Cayman and £48,783 for the Cayman S.
The new Cayman uses the same engines as the Boxster with the standard version getting a 2.7-litre flat six-cylinder engine. This is actually smaller than the 2.9-litre in the old model but it actually develops more power with 275PS which peaks up at 7400rpm. Acceleration from 0-62mph takes 5.7 seconds with the standard six-speed manual gearbox while average claimed fuel economy is 34.4mpg. The Cayman S gets the same 3.4-litre engine as its predecessor but it's been further improved and now has 325PS and a 0-62mph time of just 5.0 seconds. Choosing the optional seven-speed PDK twin-clutch automatic gearbox sees this cut by 0.1 seconds and also improves official economy from 32.1mpg (with the manual) to 35.3mpg. These improvements in performance and economy are helped by a lower weight. Porsche has made the new Cayman 30kg lighter than before thanks a lightweight body design plus all models come with an electrical recuperation system and even an engine start/stop function. PDK versions also come with a coasting system which automatically runs the engine in neutral when coasting. If the Boxster is anything to go by, the new Cayman should be even better to drive too. It has a 60mm longer wheelbase and shorter overhangs for better stability at high speeds. There's a wider track both front and back and larger alloy wheels as standard for better grip. One of the best features is the optional Porsche Torque Vectoring system which works like a rear differential and will actually slightly brake an inside wheel on a corner which means more precise cornering with less steering input needed. Standard equipment on the Cayman includes air conditioning, a CD stereo with seven-inch touchscreen, automatic headlights, start/stop, electric parking brake, 'Sport' button, 18-inch alloy wheels, top tinted windscreen, floor mats and a three year warranty. In addition to the more powerful, larger capacity engine, the Cayman S adds 19-inch alloy wheels, partial leather interior, and xenon headlights.